When you get married and have to change your last name, there’s a lot of misery that goes along with that happy concept. The legal issues that arise could result in some serious problems. That’s why it’s important to nip these issues in the bud by using the free “First Things to Do Post-Wedding Name Change” sheet. This template goes over these potential issues before you have a heart attack from all the unwarranted trouble that comes with these legal problems. To try the free template and download a copy of your own, follow the directions below. Scroll down to the bottom of this page and follow the link below.You can then use the free template to start researching items listed for the state you live in and the laws associated with them. 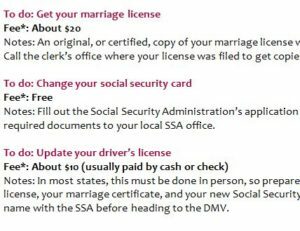 Before you even get married, it would be beneficial for you to look up these items for your state and take care of these items as soon as possible. If you need to print the free “First Things to Do Post-Wedding Name Change” template, you would simply click the “File” button and choose “Print” from the list of options. The free template also provides you with associated fees for these services, in case you wanted to know. If you’re ready to get started with the person you love and your new life together, without the legal hassle of changing your name, then download this free template today!